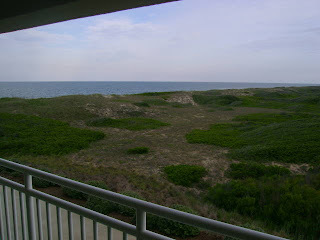 We are now out at the beach in Corolla North Carolina for the Memorial Day weekend staying at the Hampton Inn. The hotel is fantastic and its like having an entire beach to yourself. If you don't like crowds on vacation, you should try out Corolla on the Outer Banks. 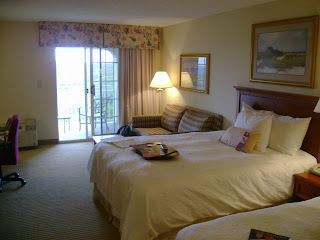 Its pretty much residential with the exception of the Hampton Inn and it is perfect for a long weekend. There are plenty of restaurants and things to do nearby in Duck or Kitty Hawk. 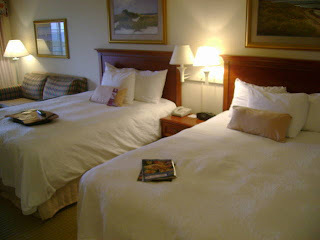 The Hampton Inn itself, is very comfortable with larger the average rooms, all with balcony and most with a view of the ocean. The hotel has 3 pools, an indoor and 2 outdoor pools, 1 with a lazy river. They have direct access to the beach and the beach area is only for hotel guests so its easy to find your own area out there. Its nice to finally be staying at a hotel for vacation instead of work, makes the trip much better.